TORONTO -- With Kawhi Leonard on a eight-day break, the Raptors' depth is shining through. Six Raptors scored in double figures Tuesday as Toronto downed the Sacramento Kings 120-105 to extend its season-high home winning streak to 10 games. The win marked the third straight game Leonard has missed for rest purposes. Toronto (36-13) has won all three, taking advantage of three Western Conference teams -- Phoenix, Memphis and the Kings -- currently out of the playoff picture. In all, Leonard has sat out 13 games this season with Toronto 11-2 in his absence. With Jonas Valanciunas recovering from thumb surgery and OG Anunoby away for personal reasons, there are minutes available. Head coach Nick Nurse dipped deep into his bench Tuesday, using 11 different players in a scrappy first half. Leonard and Anunoby are scheduled to sit out Wednesday's game in Indiana but will be back for Friday's contest in Houston. On Tuesday, the Raptors started Kyle Lowry, Fred VanVleet, Danny Green, Pascal Siakam and Serge Ibaka. "It will be interesting to see how it filters out," Nurse said. "This is a chance for these guys, man. I'm going to play the guys that are rolling and ready to play. So this is a chance for all these guys to kind of stake a claim on the position while there's minutes to be had." Whatever happens, Nurse has options. And he undoubtedly is looking forward to having his top guns rolling when the playoffs come. Leonard and Lowry have played in just 25 games together this season. Leonard, whose workload is being carefully managed after playing just nine games last season with the Spurs due to a quad injury, last saw action last Wednesday in Boston. It doesn't seem to be a problem. The Raptors have now won eight of their last nine and are 9-2 in January. Toronto's franchise record for consecutive home wins is 12. The Raptors play the next three games on the road before returning to face Milwaukee and the Clippers. Toronto was the fourth stop of a season-long six-game road trip for Sacramento, which lost two of the first three. Sacramento has dropped four straight against Toronto. Lowry and VanVleet, two point guards who have had to battle though some physical ailments this season, had 19 points apiece and combined for 16 assists. VanVleet did it early while Lowry stepped up late. VanVleet, who shot 1 for 8 in Saturday's win over Memphis, had 11 points in the first quarter. Lowry scored 11 in the fourth quarter. "I think he looked a little bit more like himself here tonight," Nurse said of Lowry who missed six games after Christmas due to lower back pain. VanVleet has his own issues. While he continues to have his lower back wrapped while on the bench, he says he is well enough to play. "It's been up and down," he said of his health. "There's days where I feel great, there's days where I feel like I've been hit by a car. That's the NBA. At this point, nobody's really 100 per cent." Siakam had 18 points while Ibaka added 15 points and 10 rebounds for his sixth double-double of the season. C.J. Miles had a season-high 15 for Toronto. The Raptors made 16 three-pointers to seven for Sacramento. Toronto is 17-4 this season when it makes 12 or more three-pointers a game. 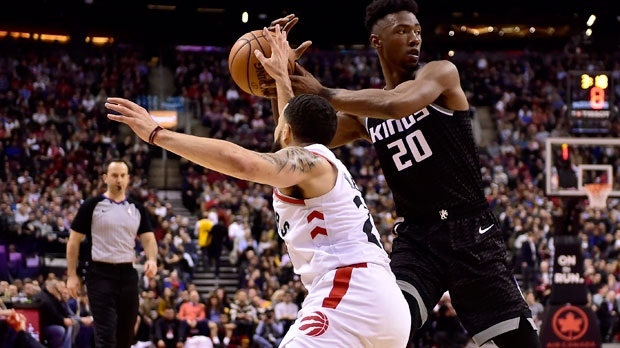 A 9-0 Kings run, during which Toronto missed five straight shots and turned the ball over, cooled the Raptors late in the first quarter and Sacramento led 34-29 going into the second quarter. The Raptors came out firing in the second quarter with Miles triggering an 8-0 run with a pair of three-pointers as Toronto pulled ahead. The Raptors held the Kings to 22 points in the second quarter, leading by as many as seven before heading to the locker-room up 60-56. Toronto led 73-64 only to see Sacramento reel off nine straight points to tie the game with 3:35 remaining in the third. The Raptors answered with a 15-5 run of their own and led 88-78 after three quarters, with the Kings restricted to another 22-points quarter. Toronto led by double digits for most of the fourth quarter. Sacramento (24-24) rested De'Aaron Fox, Iman Shumpert and Nemanja Bjelica, all of whom started Monday's loss in Brooklyn. Marvin Bagley III, a 19-year-old rookie from Duke, led the Kings with 22 points in his first career start. Sacramento had seven players in double figures. Kings coach Dave Joerger said he was proud of his team's effort, playing a second night in a row and having to face a quality team. "I feel like maybe we earned their respect tonight with how hard we played and how fast we played," he said. "We made some mistakes but they were honest mistakes." Earlier in the day, a former top Kings executive pleaded guilty to siphoning US$13.4 million from the team to buy Southern California beachfront properties. Former chief revenue officer Jeffrey David faces a maximum of 10 years in prison at sentencing April 15 on federal charges of wire fraud and identity theft.